I have never been very regular with my blog posts, but of late, it's been really difficult for me to stick to annny kind of a schedule. 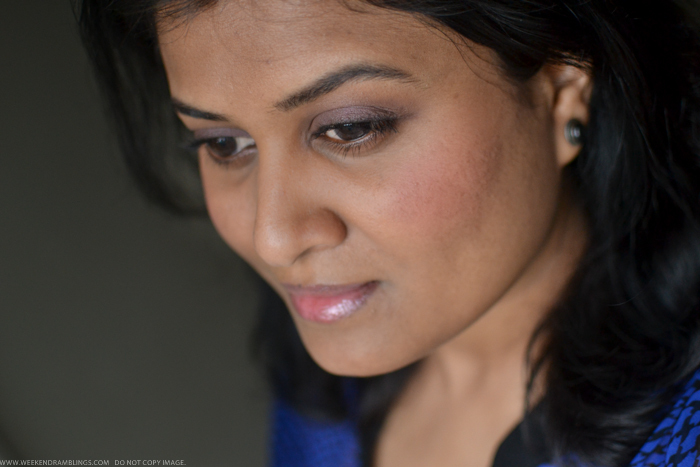 Time management is never going to be on my strengths list :P This weekend, though, I have been at home for the most part thanks to "the game," and I got a bit of time to click some photos and share this makeup look that I have been sporting for a few days now. 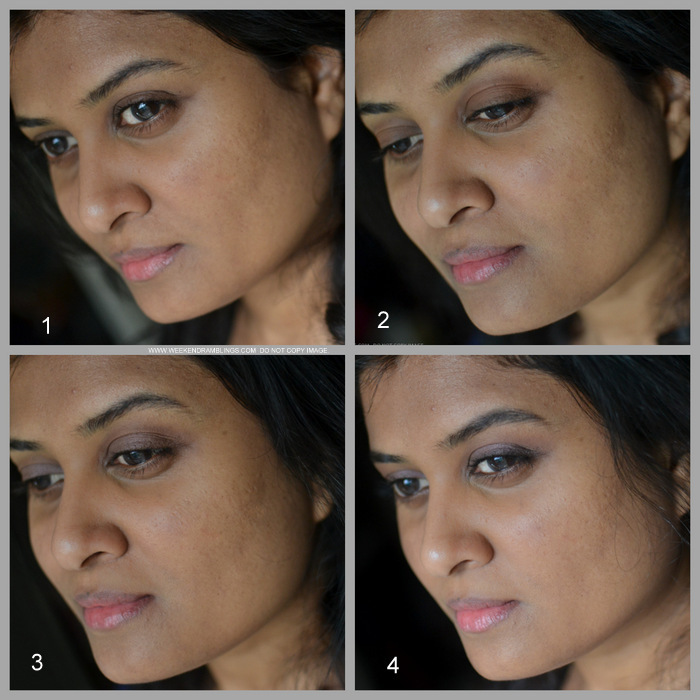 I was checking through my blushes and rediscovered the Burberry Coral Pink - a bright pink that's been wallowing unused for a while now, but as it happens with old makeup rediscovered, this is my new love now :D I have been pairing it with a soft wash of purple-grey on the eyes, and here's an easy breakdown on the look. 1. For my eyes, I started with a base/primer - Urban Decay Primer Potion and also used NARS concealer in Caramel under the brows to take down some of the discoloration. 2. 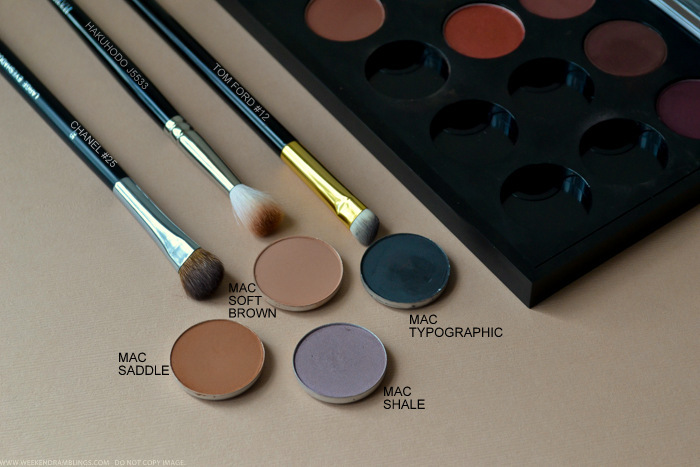 Applied MAC Saddle all over the lid, up to the crease. 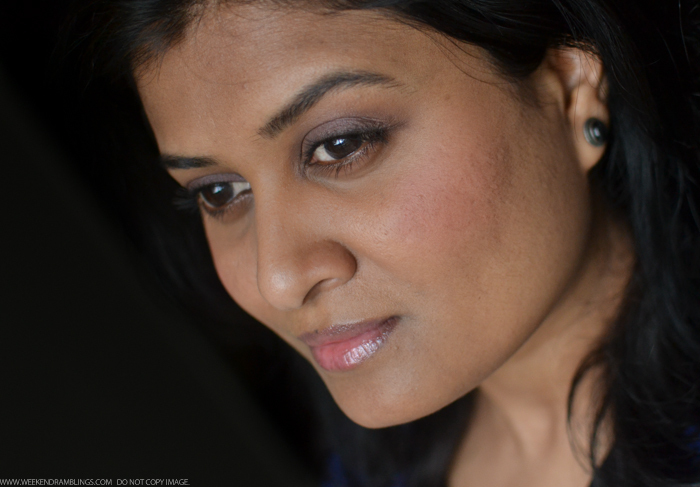 I wanted a warm brown shadow that would be close to my skin tone but would also reduce some of the darkness on my eyelids. 3. 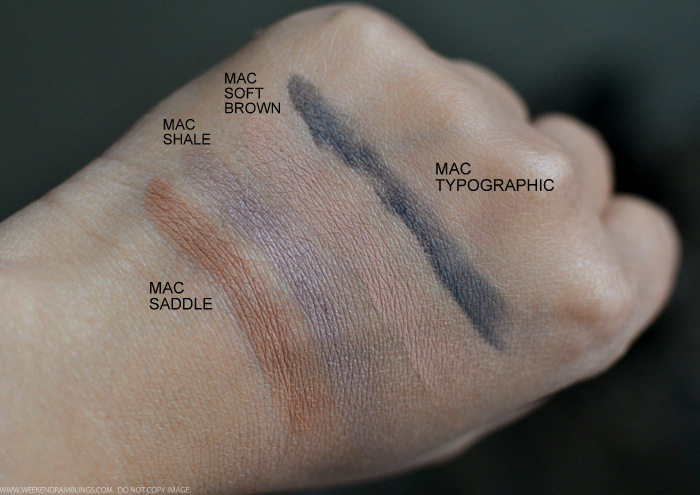 Applied MAC Shale - a greyish-purple shadow - all over the lid, over MAC Saddle. Used on it's own, this would have been a bit ashy on my eyes, but I find that using it over a warmer brown eyeshadow softens the grey and gives it a much more wearable, soft purple shade. 4. Using a smudger brush, applied MAC Typographic along the lashline, keeping the color soft and thicker along the outer corner. Curled lashes, applied mascara, and also used a brown eyeliner along the lashline just to give it a hint of darkness. If the black shadow liner along the lashes seems a bit too dark/prominent (like it turned out for me in the last photo) just pat on some Shale with your fingers over the eyelid to soften the liner. For the rest of my face, I used the usual base of Chanel Perfection Lumiere (BA34) and Urban Decay Naked Skin Beauty Balm, and a mix of NARS concealers (Caramel and Biscuit) and Bobbi Brown Dark Peach corrector for my undereye darkness. That done, I powdered the makeup in place with Rimmel Stay Matte Pressed powder and added Burberry Blush in Coral Pink for a pop of pink. For my lips, I wanted to keep it a softer pink and opted for a soft mauve gloss - Chanel Levres Scintillantes Glossimer in Wild Rose. I have quite unevenly pigmented lips, so I started with a light layer of Givenchy Brun Createur lipstick with a lip brush to even out the lips just a bit before applying the gloss. 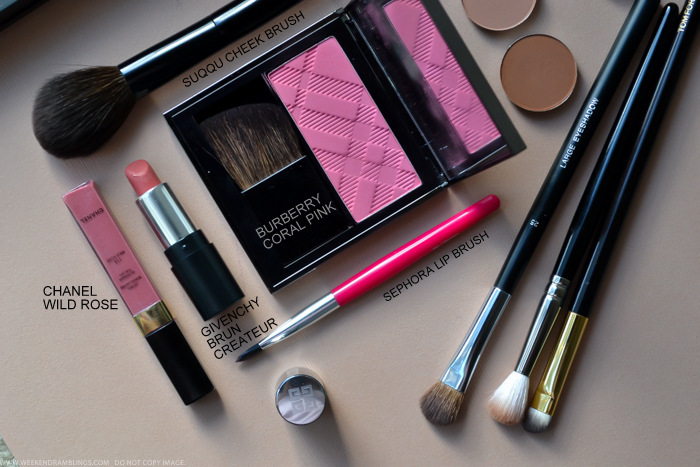 Burberry Coral Pink blush applied with a Suqqu Cheek Brush - perfect brush for anyone who likes a softer blush application and/or to apply the more-pigmented blushes. 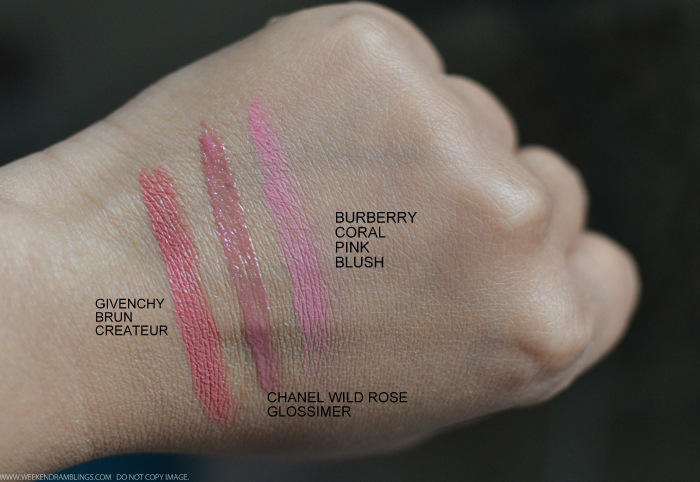 Swatches (L to R) - Givenchy Brun Createur lipstick, which for some reason is looking more coral on my swatch - is more peach/brown in real life. So that was my makeup look for the day/week - I have been wearing the exact same makeup for soooo many days now, especially since I couldn't complete the photos for the post on the same day - but I love how easy and fast it is, and the blush is just perfect for the weather here. What about you - discovered any old favorites of late? This is so chic.... no not chic... this is sophisticated!